When you're importing Subscribers, you may need to split the first and last names. Here's how! 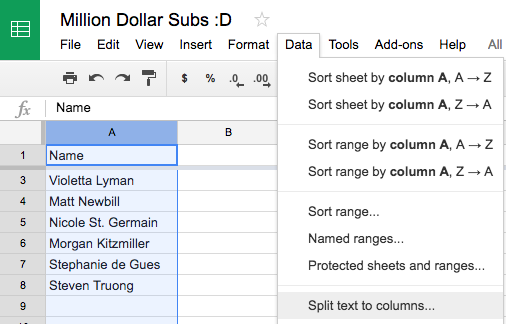 So, you have a csv to import, where the Subscriber's entire name is in one column. Like "Matt Ragland". Since most import tools (including imports to ConvertKit) import based on the columns, and not the data in them, you'll need to split those names in order to have them listed as first name and last name in ConvertKit. Luckily this is pretty easy with any spreadsheet tool, including Google Sheets! Here's how to separate those names. 1. Upload your file to a new sheet, with columns for the name and email. 2. Add at least 3 columns after the name field. This is where other names will go. Why 3 (or more)? because it will split out based on each name after the first name. So see how Nicole has "St Germain" and Steph has "de Gues"? Both of those names will get a column. Too few columns and it will override the email addresses. Then select the separator as Space. All you have to do now is consolidate the names into a single field, like St Germain and de Gues. Still a bit of work, depending on your list, but you've saved hours of time splitting them all out manually. Or if you just want to use first name only, you're done!